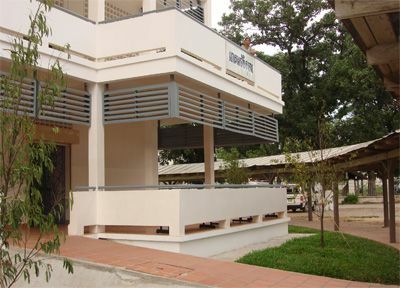 The main entrance of the Joseph P. Sullivan Outpatient Center of Excellence for TB and AIDS Care of Children at the Khmer Soviet Friendship Hospital in Phnom Penh, Cambodia. The building was designed by Peter Rose, architect and adjunct professor of architecture at the Harvard Graduate School of Design. Cambodian officials gather at the ceremony including their Excellencies the Minister of Health Mam Bun Heng, the Director of the National AIDS Program Mean Chhi Vunh, the Director of the National TB Program Mao Tan Eang, and Dr. Seng Ly, Director of the Khmer Soviet Friendship Hospital. KSFH doctors and staff at the opening. Dr. Seng Ly, Director of the Khmer Soviet Friendship Hospital. His Excellency Mam Bun Heng (left) congratulates Dr. Seng Ly at the opening ceremony. Officials and guests listen to speakers. Officials greeted by monks who blessed the center at its opening. CHC Executive director Sok Thim (right) accepts a medal from the Prime Minister of Cambodia, Hun Sen, presented by the Minister of Health H.E. Mam Bun Heng. A photo of the late Joseph P. Sullivan displayed at the dedication. Photo credit: Michael Grecco. Banner over the entrance to the Sullivan Center. The Sullivan Center and adjacent pediatric ward. Hospital grounds adjacent to the new clinic. Seeing a doctor at the new facility. H.E. Mam Bun Heng presents a medal from the Prime Minister to Anne Goldfeld, cofounder of the CHC. With the last brick in place, the final wall painted and new equipment at the ready, Cambodian health officials, hospital staff and GHC/CHC workers gathered recently to officially dedicate the Joseph P. Sullivan Outpatient Center of Excellence for TB and AIDS Care of Children at the Khmer Soviet Friendship Hospital in Phnom Penh. Sullivan, who died in 2006, was a Chicago executive, a founding board member of the American Refugee Committee, and a tireless advocate for refugees around the world. The GHC/CHC used funds provided by his wife, Jeanne Sullivan to transform a poorly equipped and underused ward at Phnom Penh's largest public hospital into a model facility for children with tuberculosis and AIDS. The newly constructed pediatric outpatient clinic, the first of its kind in a public hospital in Cambodia, is already caring for more than 400 children living with HIV. Dr. San Sengly, the director of the Khmer Soviet Friendship Hospital, officiated at the afternoon ceremony where the Minister of Health, His Excellency Doctor Mam Bunheng officially opened the ward and outpatient facility. Mam described the importance of this renovation for the children of Cambodia and for the KSFH, a flagship public hospital. GHC/CHC cofounder Dr. Anne Goldfeld related the history of the CHC's work in Cambodia, beginning with the group's efforts to help rebuild Cambodia's health infrastructure, destroyed after years of war, and to deliver critically needed care to adults and children infected and affected with HIV and TB. The special needs of children led to the opening in 2006 of the Maddox Chivan Children's Center, a model program for the integrated care of children and adolescents affected by HIV. In the new clinic, more children will have access to free medical care and outstanding social services in collaboration with the Maddox, she said. Dr. Sok Thim, cofounder and Executive Director of CHC translated Goldfeld's remarks into Khmer. "The associated renovation of the pediatric ward shows how the GHC/CHC's efforts to improve care for children with TB and HIV are in fact improving care for all children,” Goldfeld added. With the adjacent maternity ward delivering around 1500 babies each year, one focus of the pediatric ward is to boost critical neonatal care for at-risk children. Awards were presented to the Sullivan family, which was accepted by Father John Barth of the Maryknoll Society, Goldfeld and Sok Thim for their help and support in making the renovation of the pediatric inpatient ward and the construction of the outpatient center possible. A beautiful picture of Sullivan commemorating his efforts on behalf of the pediatric center was displayed and later placed beside a plaque at the entrance to the outpatient center. The ceremony drew top health officials from the Cambodian government, including the Director of the National Center for HIV, AIDS, Dermatology and STDs His Excellency Doctor Mean Chi Vun, and Head of the National Tuberculosis Program His Excellency Doctor Mao Tan Eng.